Shannon Hale (1974-present) has been publishing for middle grade readers and young adults since 2003. She began writing at the age of ten, and earned a Bachelor’s Degree in English and a Master’s Degree in Creative Writing. Here is one author who followed a straight path to her dream! She did take a side step here and then to work as a missionary in Paraguay and to develop web based training for communications companies. 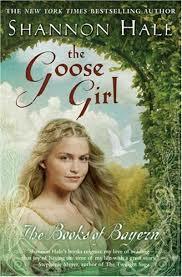 The first books that drew me in was The Goose Girl (2003) and Enna Burning. (2004). In The Goose Girl, Ani develops the skill of animal speak but has a difficult time communicating with other people. When she is sent to another kingdom to marry the king, her lady-in-waiting turns everyone against her, forcing her to become the king’s goose girl instead. Unable to speak, she has to find her own magic to take her rightful place as queen. The sequel, Enna Burning, follows a secondary character from the first book. Enna and her brother live in the forest. One day he comes home with a magical piece of vellum which allows him to start fires without a spark. She is both fascinated and frightened by this. When the land goes to war, she must learn to control this magic and find a way toward peace. There are two other books that are part of this series – River Secrets (2006) and Forest Born (2009). Both are on my wish list! 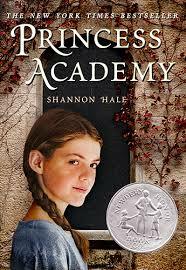 Many people will recognize Ms. Hale’s name from The Princess Academy novels. I have only read the first in the series and loved it! The Princess Academy (2005) takes place in a mountain region where Miri’s ancestors have forged stone for centuries. The king’s priests decide that the next queen will come from her village, so all the girls are forced to come down the mountain to attend the academy to learn to be a princess. To win such an honor would give her all the riches she could desire, but it would mean leaving behind her home. Another book that I fell in love with was Book of a Thousand Days (2007). A maid and her mistress are locked in a tower for seven years because Lady Saren refuses to marry a man she despises. It is another retelling of a classic Grimm fairy tale! At Ever After High, an enchanting boarding school, the children of fairytale legends prepare themselves to fulfill their destinies as the next generation of Snow Whites, Prince Charmings and Evil Queens…whether they want to or not. Each year on Legacy Day, students sign the Storybook of Legends to seal their scripted fates. For generations, the Village of Book End has whispered that refusing to sign means The End-both for a story and for your life. But this year, one brave student takes her story into her own hands and tries to shut the book on tradition. Find out if it leads to a happy ending… or a happily never after. 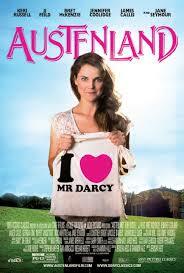 Another series, Austenland (2007) and Midnight in Austenland is actually written for adults. The main character can’t seem to find Mr. Right because she is obsessed with Jane Austen’s Mr. Darcy. A relative sends her to a resort for Austen-obsessed fans that will either finally cure her of her addiction, or help her find the man of her dreams. This was also made into a movie in 2013! I also came across a new book by Ms. Hale called Dangerous (2015). This seems completely different for her MG/YA audiences. The main character gets a spot at a NASA-type camp and ends up having to save the world from annihilation! I may have to check this one out too! ← The Big Reveal! My Book!